Friends and other Weirdness – Are We Where Yet?!! Leaving NOLA, our first stop was Houston, Tx. Here our plan was to visit Barbara and Jacob Leon for a meal and conversation. Jacob and Barbara, as they should, had important Fan-stuff to do! 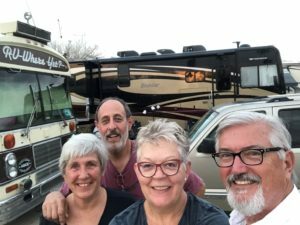 We had tee’d up a Saturday Afternoon appointment at a Starbucks or similar venue near the RV Park we selected because it was nearby to their home. At the last minute they HAD TO CHANGE. EMERGENCY. EMERGENCY!! The Texans Playoff Game was that afternoon, and, well, Jacob and Barbara, as they should, had important Fan-stuff to do! So, we rescheduled for the next morning, before checkout and Liz and I had a delightful dinner. Turns out it was a VERY HAZARDOUS WALK. The hazard was NOT what the clerk was worried about, though. She was uncomfortable with the tent community under the overpass between the RV park and the restaurants, etc. No, that part was NOT hazardous. The RV park was about ¾ mile from NRG Stadium, where the Texan Playoff Game was about to take place. Now in our experience from near Wrigley Field, pedestrians are KING and are CODDLED, blocking traffic for blocks and hours. And motorists tolerate this. NOT IN HOUSTON. We discovered how pedestrian-unfriendly the area (and Texans? Texas?) are. Despite having a CLEAR “WALK” signal (you know, the white letters that say “WALK”) , the cars heading to the stadium refused to give way – some even honking at us as we attempted to cross a street. This repeated through several cycles of the lite. No way were these strange “pedestrian” creatures going to impede TRAFFIC!!!! Clearly the “Pedestrian” is rare in those parts. Eventually, a couple motorcycle cops leading a motorcade to the stadium for someone rich and/or famous were able to stop traffic, and we scooted across the road before the “normal” Texas motorists again made that impossible. We ultimately did meet up with Barbara and Jacob at a little French Pastry shop – we on the way out of town towards our next stop, and they on the way to Austin to babysit for grandkids. It was GREAT to catch up! While in Houston, we had hoped to get our cracked windshield replaced. We had found a place called Rush Bus Services who ordered the new glass, but it had not yet arrived by the time we left. They agreed to simply hold the windshield for us until mid-February…without any kind of deposit or anything else. 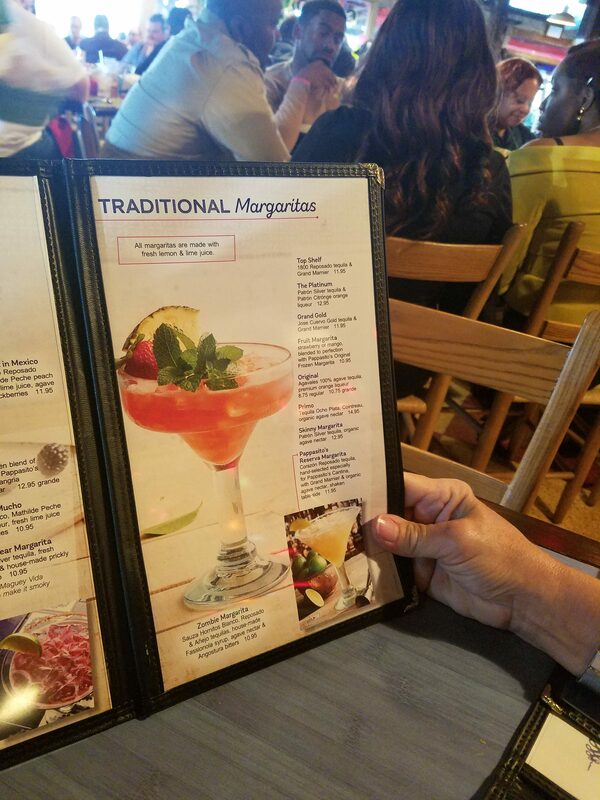 And their prices, according to our insurance company, were EXCELLENT (not that it matters to us – we have a $0 glass deductible). Speaking of insurance, Flo wasn’t going to pay since Rush was not on their provider list. Before I found Rush, Progressive had been referring us to various automotive glass companies – none of which wanted anything to do with RV WHERE YET. I got fed up with the multiple calls (and worse, lack of call-backs), so I called Rush, based on recommendations from online Bluebird Resources. 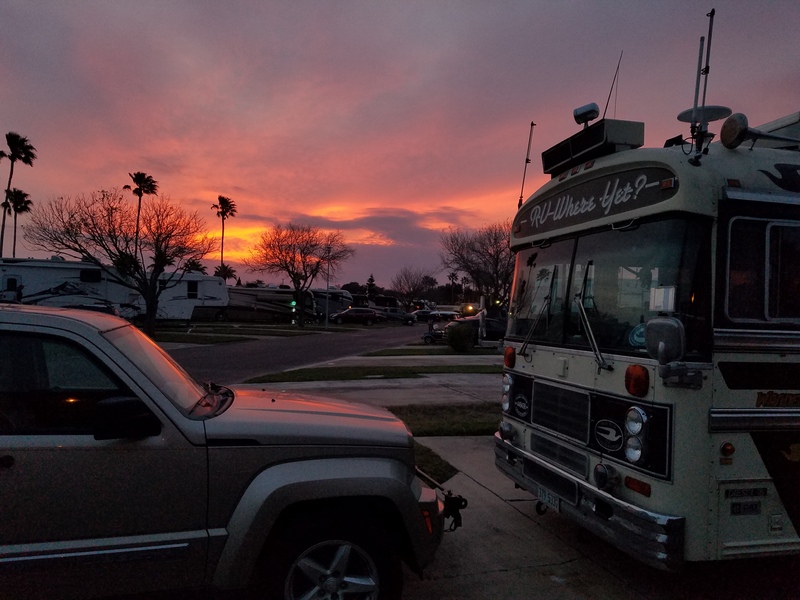 When I called Flo to tell her, she balked…until she compared the prices I had found to the ones her RV vendors (which they never referred me to) were quoting. Anyway, Rush won’t talk to Flo (they already told me this) so I have to pay Rush and then submit a claim. Progressive committed in writing that they would pay this. Our next stop was a bit of a diversion from our intended westward track towards a rally in Quartzsite, Arizona. Friends Carole and Jack Harriff, whom we know from our dance-club days in Chicago, had also begun the next (RV) phase of their lives. I had been tracking their orbit on Facebook, and realized they were at the southern-most point of Texas. And WE were in Texas. How could we NOT share a couple meals with them. Anyway, we enjoyed a couple progressive meals with our coaches sparked in adjacent spots, and great conversation. The whole event was like “America’s Got Talent” only LOTS OLDER. And even a ”Rock and Roll Jam” evening in the RV Park. There were a few musicians on stage in the activity center who apparently live in the park (or a nearby park – the evening was open to all). And others came up with their guitars, tambourines or whatever and sang things. Some recognizable, some not so much. The whole event was like “America’s Got Talent” only LOTS OLDER. There was a little dancing, though, which was good, since as long as the drummer and guitar could keep time, it did not matter if the lyrics and tune were somewhat familiar but unrecognizable! 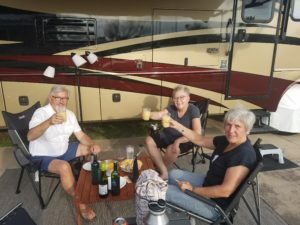 Our meals were so much more than just eating good food with good friends… These included learning and sharing some RV-Friendly cooking strategies. Now, the Harriffs have a much more “capable” kitchen in their coach (not to mention cooks in the kitchen) …complete with convection oven. So their dishes were gourmet-RV. Ours were more Camping-ish given that our oven heats VERY unevenly and the stove is small. But we do manage and see these as challenges to overcome, and that make the end result even better since we have to EARN IT. Bring to a boil and simmer for 3 hours. Then, open the can with a church key and serve it (yep — right from the glamourous can), poured over sponge cake with fruit. Or, pour it out of the can into a gravy boat (which no RV EVER has had onboard…even Jack and Carole’s) and PRETEND that the exquisite, caramel-ey goodness took all afternoon to prepare…Which it did, but requiring no effort or cooking skill or fancy appliances whatsoever. Try it…you WONT BELIEVE how good this is!! If there is any leftover, slice up an apple and spread it on liberally (or conservatively if in a Red-state). YUM!!! We also had “Mitchells” which is what we now call the Margaritas made with Carol and Charlie Mitchell’s recipe (which we learned at the Eclipse Rally we attended 2 summers ago). Starting with a can of frozen Lime-ade, add Tequila and Triple Sec and ice to the blender — the quantity of Tequila per batch is “2/3-3/4 of a can, depending on how your day is going…” according to Charlie. Since we are retired, we’ll need to figure out some other way to calculate that key ingredient, as every day is a perfect day for us!!! While parked next to the Harriffs, I helped Jack sort out a few issues with their RV. Now their’s is a 2013 model – practically an INFANT compared to ours; Yet it was still having issues. And Jack, being only on the road for a few months, had not yet sorted out how all the systems worked and where all the fuses were, etc. These are things I have a pretty good handle on in RV WHERE YET, since we have had 2 years to study! As I have said before in these pages, you take your home and bounce it down the road and you can expect to have to fix things with regularity. And, there was some weirdness to report in south Texas. As you undoubtedly know from the pages of this blog, if we don’t stumble on weirdness, we go looking for it as it is the spice of our lives! I was reviewing all the RV Parks in the Alamo, Texas Area — before we knew exactly where Jack and Carole were staying – and I discovered that several were ”Clothing Optional!” I did not know (nor want to know) that such an option was available! And of those, a few were 55+. Perhaps such places would not even rise to the level of curiosity in California. But in Far Southern , Super-Conservative Texas???? In any case, 55+ Nudist RV Resorts are an image I have been trying to unsee ever since. BTW, Harriffs were NOT staying in one of these parks. Tongue-in-cheek, I asked Jack “Why Not… ” Jack simply said, ”It’s way too cold…” as though he might have considered doing so in a warmer season. I did note that the day after we left Alamo (thank goodness … I can imagine the Traffic Jam), El Presidente (yes, THAT ONE) was planning a visit to the actual Mexican border in the VERY nearby town of Mission, Tx. I think everyone ASSUMES this was to focus attention on and drum up support for “The Wall.” But, knowing what I know now about the “Theme” of many of the accommodations in the area, perhaps he was looking for a break from his usual resort-ing in Mar a Lago? Or maybe even a new business concept FOR Mar a Lago? YIKES…that is an even WORSE image, now working hard at unseeing! Glad that you were able to visit with the Leons. Good friendships formed through JHI. We are waiting for you in Quartzite, we have all the makings forva few gallons of Mitchell’s! you two not investing in Potential southern white house venture?